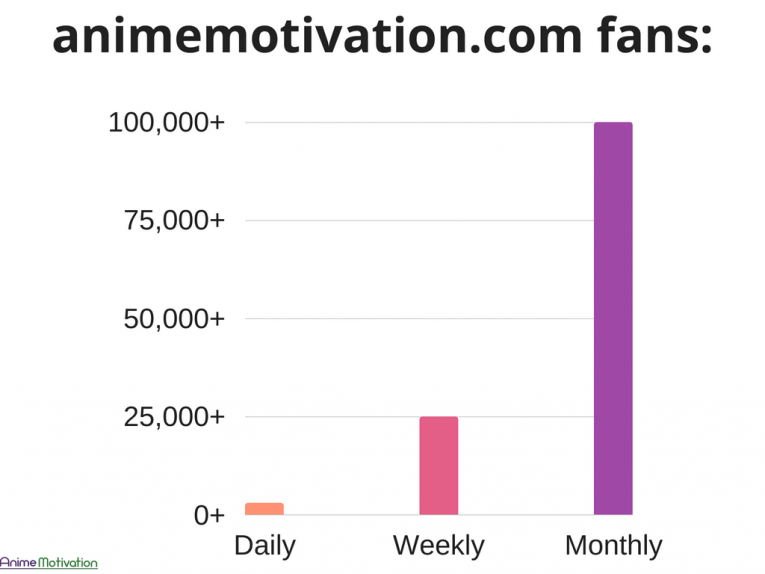 New Milestone: Anime Motivation Now Reaches Over 100,000+ Fans Per Month! Anime Motivation started back in mid-2016. With a full-on commitment to the website between-autumn/winter time. Back then there was barely 1000 fans (and 0 customers) visiting the website at all. With a “few” followers on any social network. The goal was (and still is) to make a difference in the anime community. After the site went live in 2016, that goal started off with anime quotes and life lessons. This is something that still differentiates the content on Anime Motivation to this day, since no anime site centers their brand around “anime motivation” (no pun intended). After seeing how one fan in particular was impacted by an anime quote published on Anime Motivation, this set the stage for a 100% commitment to the goal and website. With bigger things in the pipeline planned between now and into the future. As you can see – 60,000 visitors came to the website per month. All this has been achieved in 1.5 years. Exceeding expectations by far. Originally the goal was to reach over 100,000+ fans per month by January 2019. Maybe a giveaway (or something along those lines) sounds good for the next milestone.